Humancoin brings together philanthropists and recipients of funds on one P2P platform in the most convenient and transparent way . The blockchain platform will breathe new life into the charity industry and is the engine of growth. At the same time, it is the main global loyalty program for an increasing number of e-Commerce partners. 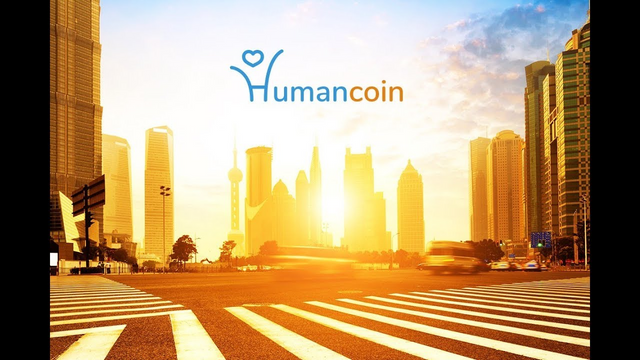 The Humancoin platform offers a viable and lasting solution for the charity industry through the consolidation of three revolutionary processes, the cryptocurrency market, the blockchain technology, and the e-commerce loyalty programs. This platform brings together all the stakeholders including the donors, recipients and e-commerce players. The company built an interface to enable the participants to quickly and seamlessly send donations to any country of their choice, to monitor the transactions and also have the chance to review the reports. The benefits of using this platform are enormous. First, it helps resolve trust issues by ensuring security, traceability, and transparency. Also, it eliminates the long charity chain and the middlemen involved in the transactions. This includes; NGOs, Banks, Law Firms and State Bodies. Importantly, Philanthropists are the biggest winner and they tend to benefit massively from this platform. It enables them to monitor the transaction and the recipients of grants are only able to expend the resources on worthwhile projects after meeting mandatory conditions. Humancoin tokens can be easily converted to any other tokens, miles, bonuses, coupons. Token holders will be encouraged to hold them to take advantage of attractive benefits and this ensures long-term stable demand. As the number of partners and the scale of cooperation in the Humancoin network grows, the token’s popularity grows. There is no doubt that there are major changes in the way donations are made, but even for this purpose the charity industry has not been able to overcome its main obstacles. Donors, many of which are private companies, have trust issues when they donate. All these remarkable innovations will enhance the growth of the charity industry. As at today, reputable charitable organizations like Save the children, Red Cross, and United Way and a host of others have begun accepting funds and other donations in cryptocurrency. Also, there are confirmed reports that the new technology is currently being studied by big market players such as the World Bank, the Bill and Melinda Gates Foundation, and the World Bank. On the Humancoin platform, their token will engage numerous cryptocurrency users from different varieties of loyalty programs all over the globe to guarantee a stable and lasting demand for tokens. 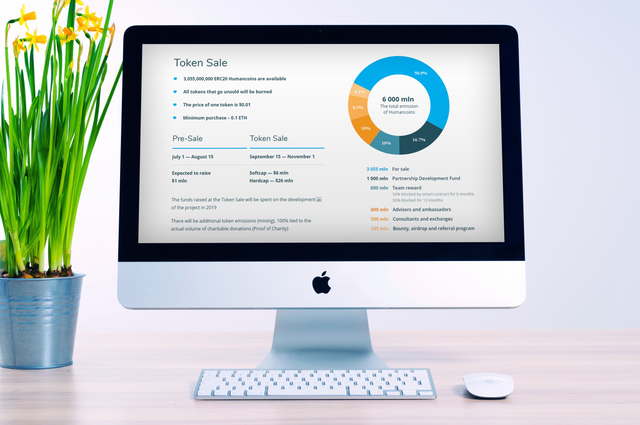 The funds generated at the Token sale will determine the financial strategy to be deployed by the company which will be expended on various projects to be executed in Q4 of 2018-2019. Also note that most of the funds are spent on charities. The operational cost of a transaction is the transaction fee. Humancoin ID can easily be converted into tokens, miles, bonuses, other coupons. Token holders will be asked to hold them to take advantage of attractive, and this provides long-term, stable demand. As the number of partners and the scale of cooperation in the Humancoin network grows, the popularity of tokens grows. Long-term charitable networks, consisting of banks, non-governmental organizations, government agencies and law firms, will be moved to the far end with a distributed book. Using the blockchain platform will be able to provide a digital mechanism to be used to record and view any transactions. This new technology, on a larger scale, will contribute to the development of a direct funding platform. Philanthropists, as well as the benefits of selling their funds. The growth of the charity industry should be significantly increased thanks to the great benefits of blockchain technology.This remarkable project was initiated and executed by a group of experts namely; Gilas Gailer (CEO), Kate Bublik (CMO), Aravinda Babu (Blockchain and Smart Contracts Expert), Kai Hsia (Senior Software Engineer), Daniel Maximkin (Head of Digital Analytics), Nathan Van de Van (Community and Project Manager), Elena Tarasova (SMM Manager) and other special advisors. 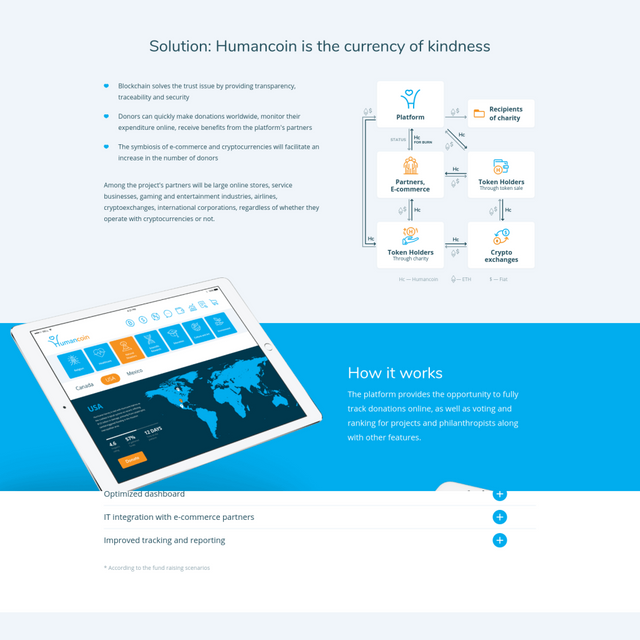 In case you are running a charitable organization and you are in limbo about making donations, the Humancoin platform has been developed to ensure that your funds are used judiciously. You have nothing to fear because your funds are secured with the Humancoin platform.